When creating a label, Easyship will send all the entered information in its system to the selected courier to generate. Once the courier receives the information, they will provide an answer, either by successfully generating a shipping label or by returning an error code. 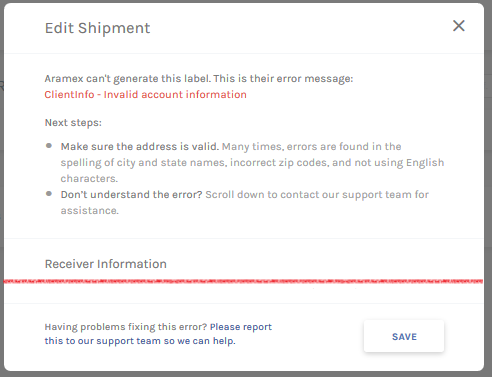 Note: This error code is what Easyship will show you in the Dashboard, further explained in the examples below. Not all errors are included in the examples, if you have trouble understanding the error, reach out to our customer service! Sometimes, you may receive an error code and the information needs to be changed. 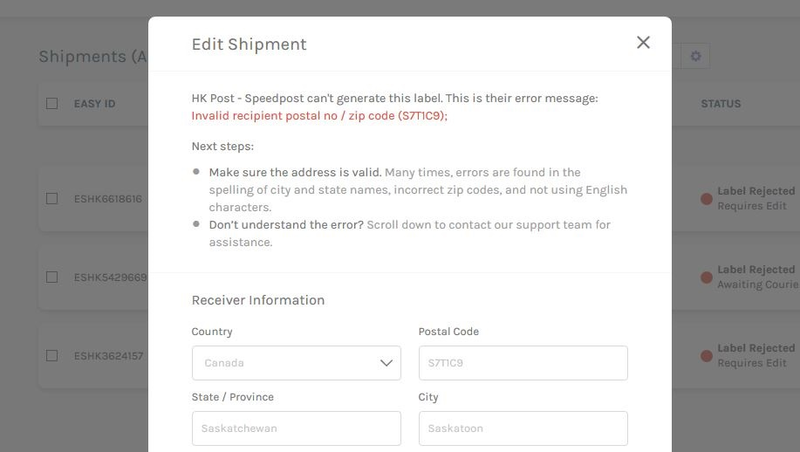 Easyship is able to share the error with you and give you the chance to fix the label, directly through the dashboard! This article will go over what happens when a label fails, and the common errors you may see. If a label fails to generate, you will find it under Manage Shipments < All, or specifically under "Rejected". The labels can have one of the following statuses if they are rejected by the courier. These labels can be fixed by you if you press EDIT! These labels are failed for unknown reasons and Easyship has reached out to the courier for more information! 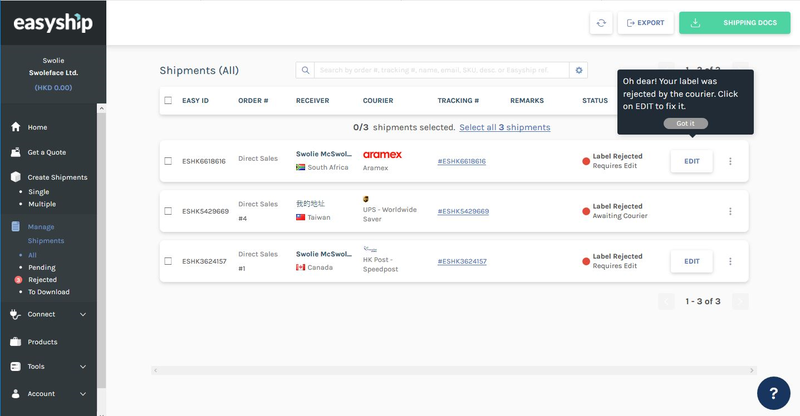 Inside EDIT you can report a rejected label to Easyship, it will then be prioritized by the team. Note that you will not receive any reply or e-mail regarding these reports by default. If you have questions regarding your rejected label, please open a ticket or send us an e-mail! If an error code is provided, you will have the chance to edit the shipment. In Manage Shipments / Rejected you will be able to edit rejected labels. Note that if you change the destination, dimensions or weights, the rate will be recalculated and you may be required to pay an additional fee to cover the increase in charges. If the weights or dimensions are decreased, you will be refunded the difference back to your Easyship account. If you are unable to find the issue of your rejected label, please report it at the bottom of the edit page! 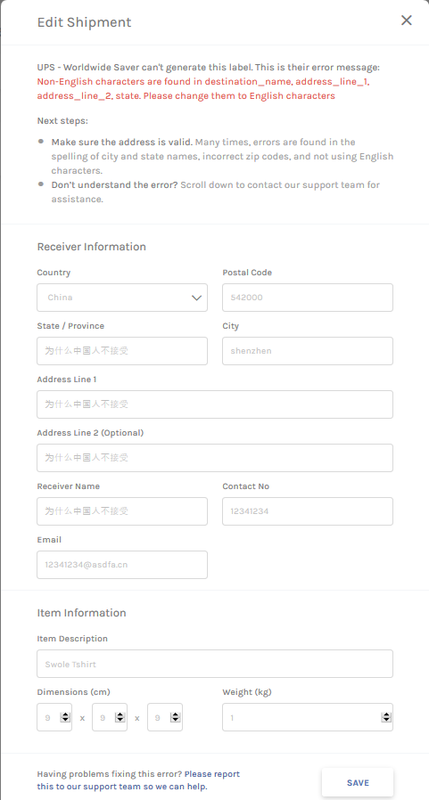 In case you are unable to find a solution to your rejected label, you can report it to Easyship for fixing. You are able to do this at the bottom of the Edit Shipment page under Rejected labels. Once reported, Easyships staff will start working on the label to fix it! Please note that there will be no e-mail reply to these reports, it simply notifies our staff to start assisting you on the rejected label! In the below example, you can see that the courier rejected the Zip code. However, upon searching online, we can find that the zipcode is actually correct! In this case, a space is needed in the correct place. This means the recipient's phone number is required and it needs to be a local number. This is so that the courier can contact the receiver and arrange delivery and/or clearance. The receivers City, state or Postcode is invalid. Please edit revise the address. Search for the zipcode by Country and City. 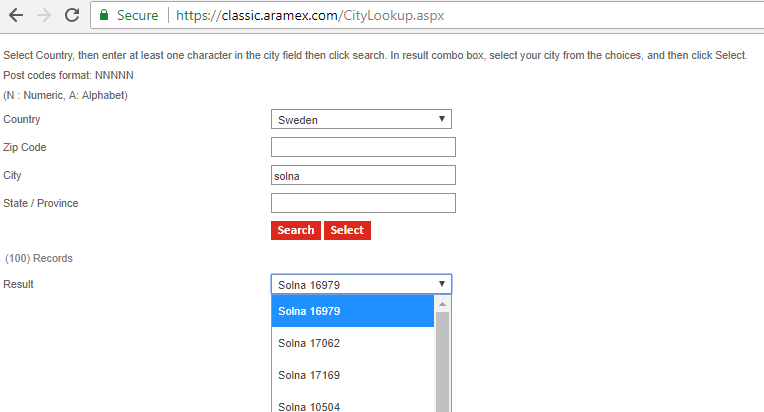 Search for the city name based on country and zipcode.